Marvel’s newest superhero movie Black Panther was released on February 16th and has already made a whopping $387 million worldwide on its opening weekend. The high-profile movie is getting praised not only for its vibrant cast including Chadwick Boseman, Michael B. Jordan and Lupita Nyong’o, but also for the way in which it conveys African culture. The plot follows T’Challa at the beginning of his journey to becoming the Wakandan hero “Black Panther” after the death of his father. Not only does T’Challa struggle with becoming the hero his people need, he also struggles with his responsibilities as King of Wakanda. Through the challenging of many foes, he discovers the successes and the failures of his family and creates a new way for his kingdom to maintain peace in the world. The set and costume design in this movie are visually stunning; through the bright colors of the individual African tribes and the rich neutral tones of the African setting, director Ryan Coogler created a perfect blend of realism and Afrofuturism to compliment the building of the universe. Like most other Marvel movies, the CGI is nearly seamless throughout the film, and the design for the Black Panther costume was sleek and modern while staying honest to the comic. One of the best things this movie has to offer is the lack of stereotyping of African culture. 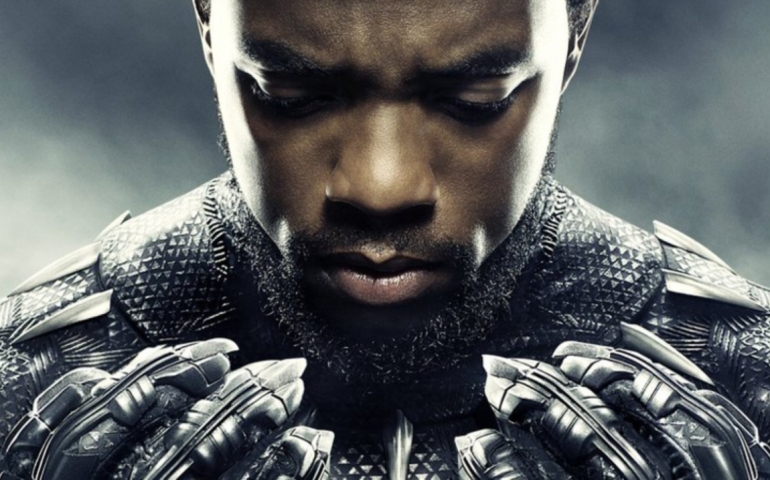 Each character felt as unique and nuanced as all of the other characters in Marvel’s universe, yet Coogler celebrated the African culture and avoided the stereotyping African culture often sees. In many ways, it seemed to embrace the vibrancy of Africa The Lion King so beautifully portrayed, certain scenes seeming to pay homage to the beloved Disney movie. While Black Panther was visually beautiful and the expression of African culture seemed authentic, the plot of the movie is no different than the other Marvel movies. The character development is stereotypical and there is minimal depth to characters outside of the hero and the villain. There are multiple action sequences, love interest sidestories and multiple “culturally relevant” and often forced jokes that Marvel has etched into its movie-making formula. While this movie does follow the “Marvel formula” for the most part, it breaks the equation through the villain’s story. The villain of the plot seems to be the best part about this movie as the character has depth and causes tension within the hero. To counter that, the character of T’Challa seems two-dimensional at times as he doesn’t struggle through a hero’s journey but is rather born into greatness unlike many of the other Marvel heroes. Overall, while Marvel seems to be creating the same movie with different characters in every movie they make, they do it well– this movie is fun, action-packed and full of important cultural dialogue that we must have as individuals and as nations. The theme seems to be a message of peace and equality, helping one another as a team rather than individuals. Black Panther celebrates diversity and inclusivity through the beautiful African culture.